This red and white lacquered side table is conveniently designed to fit in any room. 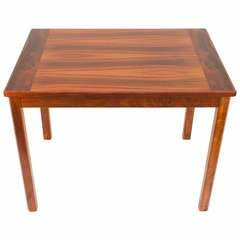 The long protruding leg slides under tables and benches to maximize your space. 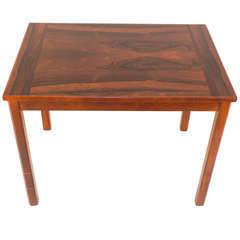 This table can be sold as is or custom made in any color of the customers' choosing. 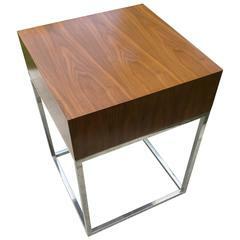 Measurements: 26" H x 14.5" W x 17" D.
Gorgeous Space Age side table from soft seating series designed by William Andrus for Steelcase. This example is in good original condition, some minor scuffs and dings. Super modern table with metal structure and covered copper top. 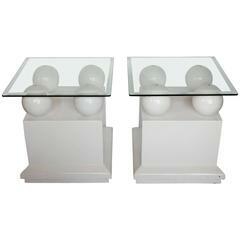 Spectacular modern lacquered side tables with glass tops. Vintage side table with drawer, chrome base and glass top.